How far do you like to see underwater? Consider 50 to 60 feet ideal? Well, around Isla Mujeres, how about typical viz of 80 to 100 feet! A dive trip to Isla Mujeres is pretty much a bucket list item for most scuba fans. 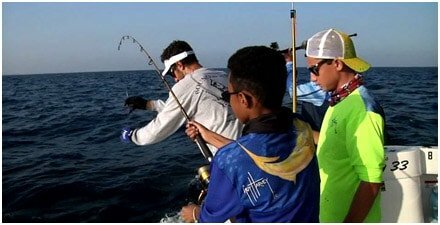 And for a beginner, the tranquil conditions, warm tropical water and practically unlimited visibility make for ideal conditions to learn the sport. Isla offers over 20 dive sites all within a 30 minute boat ride. The numerous reefs spread around the island offer vibrant marine life and coral formation in a little as 10 feet of water. For the more advanced divers there are special sites such as the Cave of Sleeping Sharks, The Cross of the Bay and Los Cuevones. And no scuba enthusiast should miss an encounter with the majestic Whale Sharks that converge on the north side of Isla Mujeres between June and September. 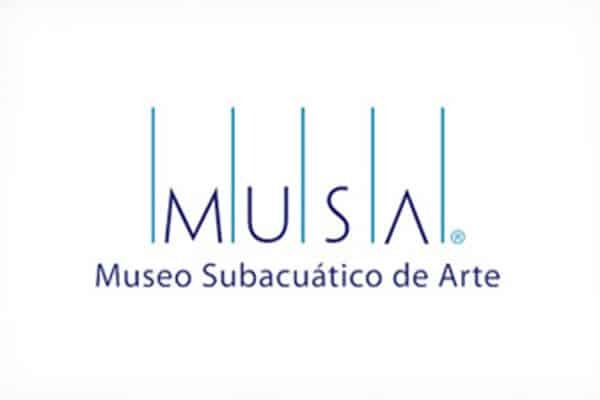 For the rest of the year, there’s MUSA, the world acclaimed Underwater Art Museum and Sculpture Garden . No migration here, everything’s affixed permanently on the bottom. 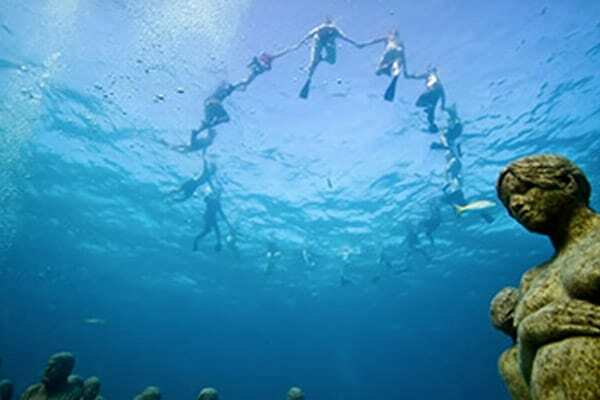 This is a “must do” for every diver and snorkeler! These rates are merely a guide to prices for standard diving activities. Most dive shops are happy to create customized diving experiences, and some operate their own private yachts for the ultimate in privacy and luxury. Don’t be bashful. 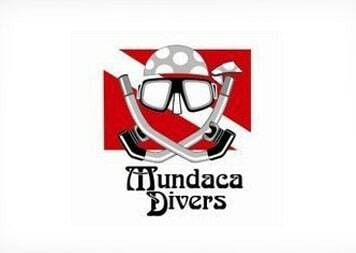 Inquire about these special dive offerings. It’s your adventure, after all! As you would expect, great diving conditions attract divers from around the world who come to Isla and turn their hobby into a business. In Isla there’s no lack of options when it comes to selecting a dive shop. Just about everyone with a boat will offer Whale Shark tours and other excursions, but not all specialize in PADI certified diving operations. Below is a selection of Dive Shops that all have PADI credentials, and are ranked within the top 10 of “Activities in Isla Mujeres” by TripAdvisor, presented in order of comparative ranking. Ranked highest in popularity by TripAdvisor, with a 2013 Certificate of Excellence. Located outside of El Centro at the Avalon Beach Club. 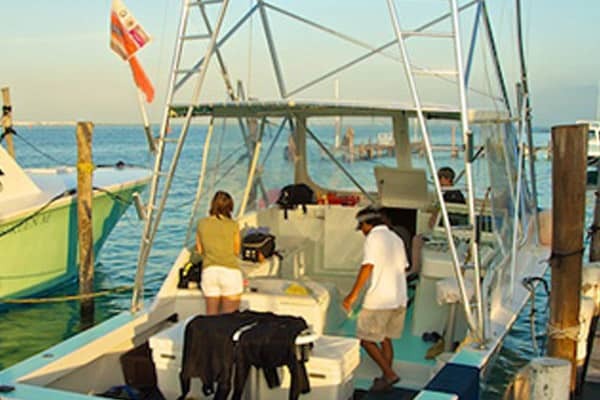 Located in El Centro, offering the largest dive fleet in Isla, including a 40ft catamaran with twin diesels. 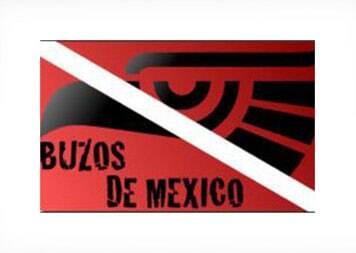 Buzos de Mexico is a popular choice for divers looking for a larger dive boat platform. 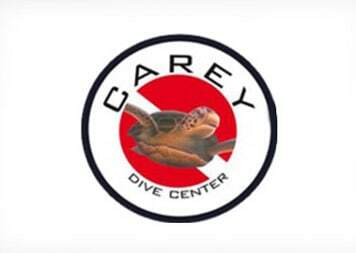 Located in El Centro, offering a full range of dive activities. Owned and operated by Gilberto Pat Hoil, he has been diving Isla since childhood. the Underwater Art Museum and Sculpture Garden. This artistic project has marine conservation at its core mission. 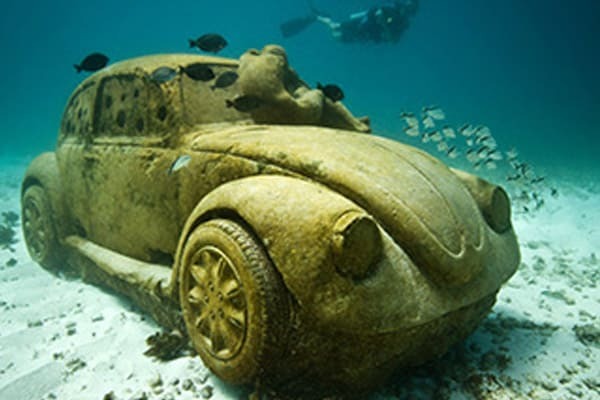 The underwater sculptures are the work of Mexico-based British sculptor Jason deCaires Taylor. 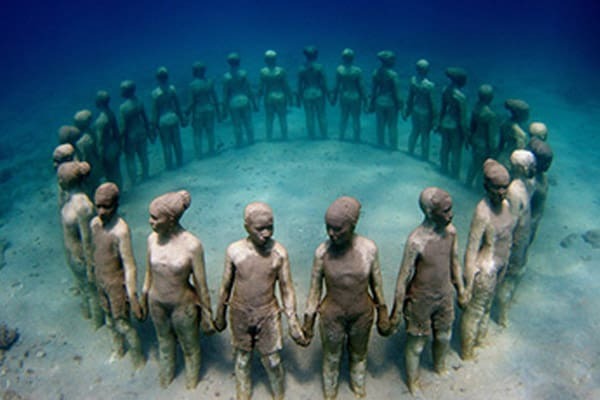 In 2006, Taylor founded and created the world’s first underwater sculpture park off the coast of Grenada in the West Indies. 5 years later National Geographic now lists it as one of the Top 25 Wonders of the World. His second project MUSA was also subsequently described by Forbes in 2011 as one of the world’s most unique travel destinations. 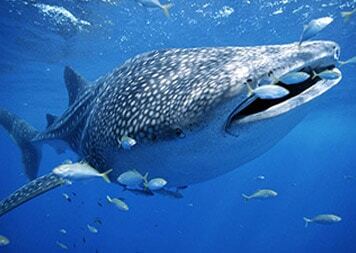 Whale sharks are the largest fish in the world and also an endangered species. They are gentle, safe & friendly to swim with, yet they remain a mystery to science. Scientists have been working extremely hard for many years to find out how and where these large fish breed, why they travel such far distances, and how they disappear deep down below the ocean’s surface, much further than humans can explore. It is very hard to get important samples needed for testing because of their extremely thick skin. 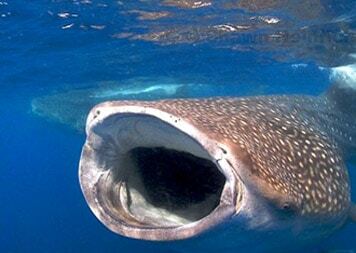 The whale shark is a filter feeder – one of only three known filter feeding shark species. 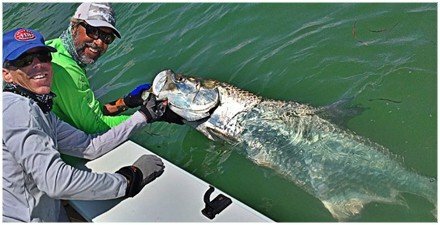 In the summer some 1,400 whale sharks typically make their way through the waters of Isla Mujeres according to Dr. Robert Hueter, Director of the Center for Shark Research, Mote Marine Laboratory. The congregation occurs generally from June to September. To protect the shale sharks during this period, the government establishes the formal dates for the season and enforces strict regulations regarding the conduct of Whale Shark encounter tours. These are restricted exclusively to snorkeling. Scuba is not allowed, nor is touching the animals or flash photography. Boats have to have guides with regulated numbers of snorkelers per boat. Flotation devices have to be worn; a wet suit is considered a flotation device. The annual congregations are widely studied and photographed by scientists from around the world. In 2009 one of the largest aggregations ever reported occurred off Isla Mujeres, when some 420 Whale Sharks were observed in a single aerial survey! A Whale Shark Encounter is a magical experience, best not ruined by an excursion on an uncomfortable boat filled with fellow tourists. This is especially true if you’re an accomplished underwater photographer looking to expand your portfolio with likely stunning images, certain to be “photo bombed” as the number of snorkelers grows. Our Expedition Outfitter, Keen M, is one of the most respected Whale Shark Encounter operators in the industry, specializing in hosting scientists and professional underwater photography teams that typically will charter for one week expeditions. To ensure a quality experience, Keen M trips are limited to 10 guests. The Lilly M is a 36 ft. custom Vernese Express, powered by a 450 hp diesel, offering complete comfort for divers and their gear. Before you book a Whale Shark Encounter with anyone, check with Keen M. Unless you arrange your own private charter, you won’t find a similar quality experience. 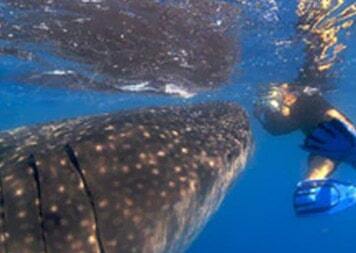 For TripAdvisor’s list of operators offering Whale Shark excursions, click here. The Whale Shark has become an icon of Isla Mujeres’ eco-tourism industry and the community’s effort to preserve the area’s marine ecosystem. 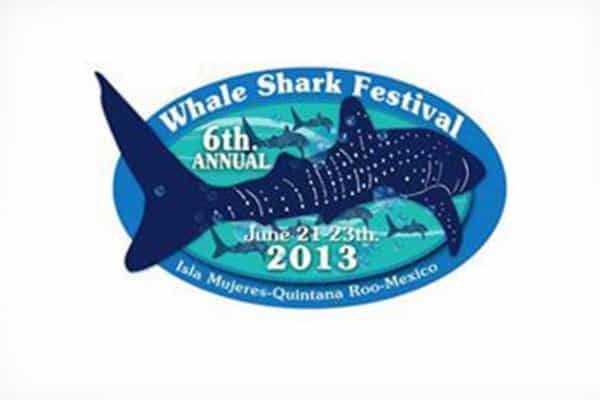 A hugely popular summer Whale Shark festival is held annually in Isla, sponsored by numerous organizations including the Georgia Aquarium.